Saturday and it's raining here... supposed to continue through the weekend. That's fine, I work. Monday's supposed to bring brilliant sunshine which is fine with me. My nephew Adam and his wife are expecting a baby in a month... give or take a couple of days. She is blond and blue eyed, he is dark complected, brown hair and brown eyes. I told them, genetically speaking, he's got it in the bag... literally. Dominant Genetics, you know? I think the odds are about 80% that baby's going to have brown hair and brown eyes. And, for those who've forgotten. Tonight I go see "Aquaman!" Be jealous... be very, very jealous. Actually, doesn't he really look like he's just escaped from some 70's Hair Band? Also, a big Thank You to the 17 people from Tanzania who decided to look at my blog!! And Im sure he will have a huge cod piece...…. 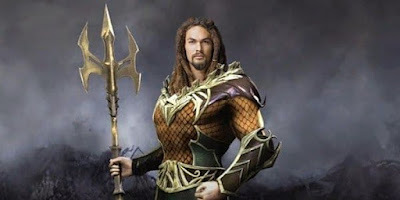 I like the way you put the fish on Aquaman. PS - on page 188 of the book. I don't trust the hunky donkey. and WHO is alex's dad? and I hope eli doesn't get killed. You will find out who Alex's dad is... and so on and so forth. Ohh let us know! I wanna know if Momoa pulls it off! Okay, so what do you want Momoa to pull off?